It was only a matter of time. 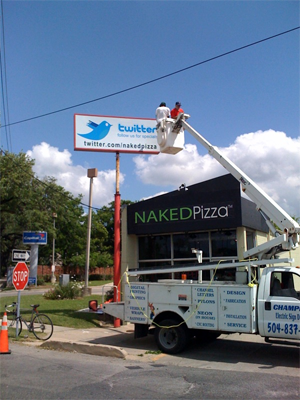 Naked Pizza, a uniquely healthy pizza joint in New Orleans, has replaced its “call for delivery” billboard in favor of something a bit more unorthodox: its Twitter handle. 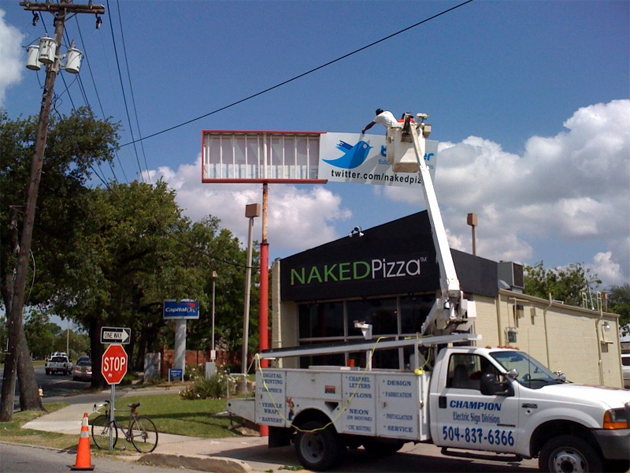 The restaurant now features a large Twitter bird above its storefront, inviting passersby to follow ‘NAKEDpizza‘ for special deals. 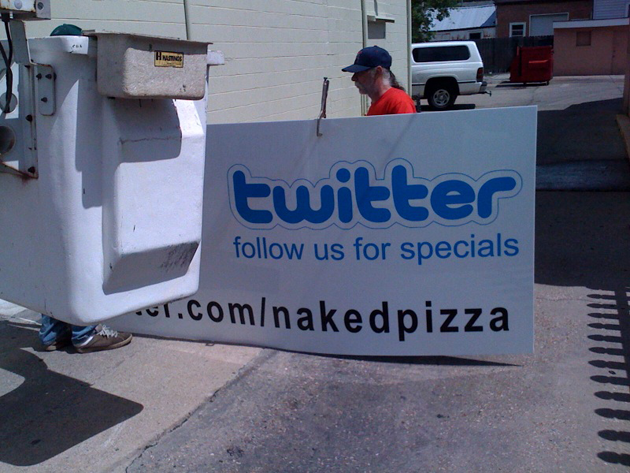 Aside from being among the first brick and mortar businesses to so prominently feature its Twitter handle, Naked Pizza is notable for a few other reasons. Its menu was created to offer the “world’s healthiest pizza”, with each slice only weighing in at a fraction of the calories and fat of standard pizza, while still tasting delicious, according to Yelp reviewers . Oh, and Mark Cuban just partnered with the company to turn it into a national franchise. To be honest I was skeptical of the sign at first (it’s fairly easy to Photoshop the Twitter logo onto a billboard), but I’ve confirmed with the New Orleans sign company that installed it that it’s real. And while it’s still a pretty strange sight to behold, it makes perfect sense. With the growing ubiquity of smart phones, free 411 services, and Google Local on the computer, looking up a restaurant’s phone number is trivial. And phone numbers only form a very fleeting bond with the business, anyway. But if a business can get a customer to add their Twitter handle, it gets a free channel to constantly remind them that they exist. By tweeting out promotions a few times a week, Naked Pizza will maintain a presence in the customer’s consciousness, and the customer gets a chance to score some cheap pizza. This isn’t the first time Twitter has been featured on a billboard. Just last week, Ashton Kutcher’s Twitter handle was displayed on thousands of digital billboards across the country in support of his quest for 1 million Twitter followers.